Photo courtesy of Chace Audio. Cinematographers are understandably interested in image permanence and motion-picture restoration, but ever since Al Jolson uttered the words “You ain’t heard nothin’ yet!” in The Jazz Singer 80 years ago, it has been a fact of movie life that sound goes hand in hand with picture. It is equally true that if a talkie lacks its sound track, there’s a fair chance the image will be left to rot as well. Although the artist may rebel at the notion, from a commercial perspective what’s the point of spending money to preserve the image if the dialogue, music and effects can no longer be heard? In many ways, sound elements are even more fragile than picture elements. For most of the last 50 years, movie sound was mixed and mastered on acetate-based, oxide-coated magnetic film stock, which is subject to the same sorts of degradation that can occur with acetate-based images: it can shrink, warp and become brittle. The adhesives that hold the magnetic coating can dry out, and the “rust” that carries the precious sound modulations can flake off and clog delicate sound heads, making it difficult to create a new sound transfer. “Vinegar Syndrome is the layman’s term for a complex chemical reaction that occurs in acetate-based film stocks and causes them to decompose,” says Thom Piper, manager of preservation and senior optical recordist at Chace Audio in Burbank. “As acetate film breaks down, it releases water and acetic acid, which causes the vinegar smell. This decomposition affects both picture and magnetic sound acetate-based films, but not equally — the catalyzing effect of the iron oxide in the magnetic coating of sound film can intensify the problem significantly. A 1,000-foot reel of 35mm acetate film can generate over a quart of ‘vinegar,’ and sound elements from as recently as 30 years ago are generating gallons of the stuff. As magnetic film decomposes, the plasticizers appear on the magnetic surface as a thick, white powder. During a transfer, this powder builds up on the sound head, causing loss of contact and dull, muffled transfers. But what to do if a soundtrack is essentially beyond recovery? The track elements were effectively unusable, and there was a very real prospect that the soundtrack would only survive in monaural sound rather than the stereo format originally heard in theaters by road-show audiences. But Piper has developed a proprietary lubricant for use on deteriorated soundtracks that Chace Audio has dubbed “ThomSlick” in his honor. “It took me about a year, on and off, to come up with the formula,” says Piper, who declines to be specific about ingredients but says they contain no carcinogens. “Others have used WD-40 to lubricate mag film, but we’ve found petroleum-based products rapidly accelerated the decomposition of the film. What we came up with doesn’t do that; it works as a lubricant, we didn’t get any buildup on the sound heads, and it didn’t affect the high-frequency response of the recordings. It doesn’t work for everything, but for mag films that are decomposing and generating a lot of head buildup, it works great. The application of ThomSlick revitalized Anne Frank’s aging stereo masters and allowed them to be transferred without screech or chatter, preserving the audio in the configuration the filmmakers intended. 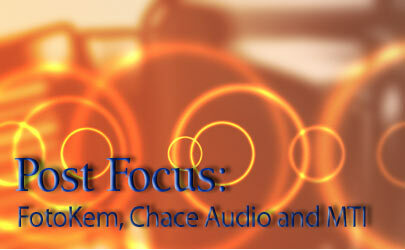 Chace Audio, (818) 842-8346, www.chace.com.